FDA posts press releases and other notices of recalls and market withdrawals from the firms involved as a service to consumers, the media, and other interested parties. FDA does not endorse either the product or the company. FOR IMMEDIATE RELEASE – August 29, 2010 – CINCINNATI -- Procter & Gamble (P&G) is voluntarily recalling a small number of bags of its Iams Proactive Health Indoor Weight & Hairball Care dry cat food which may have been sold recently in one or two stores in Loveland, Colorado. These bags have the potential to contain salmonella, although no illnesses have been reported. No other Iams pet food products are affected. 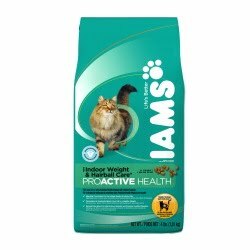 The Iams Proactive Health Indoor Weight & Hairball Care cat food in question is sold in blue 6.8-pound bags. These bags feature a code date of 02304173 (B1-B6) and the UPC number 1901403921. If you have this product, please discard it and call P&G toll-free for a product replacement at 800-862-3332 Monday-Friday, 9:00 a.m. to 6:00 p.m. EST. P&G has worked with its retailers to remove the affected product from stores in the area. P&G believes that only three bags may have been purchased recently by consumers in the area. Yet, as a precautionary measure, the company is initiating this retrieval. People handling dry pet food can become infected with salmonella, especially if they have not thoroughly washed their hands after having contact with surfaces exposed to this product. Healthy people infected with salmonella should monitor themselves for some or all of the following symptoms: nausea, vomiting, diarrhea or bloody diarrhea, abdominal cramping and fever. Rarely, salmonella can result in more serious ailments including arterial infections, endocarditis, arthritis, muscle pain, eye irritation and urinary tract symptoms. Consumers exhibiting these signs after having contact with this product should contact their healthcare providers. Pets with salmonella infections may have decreased appetite, fever and abdominal pain. If left untreated, pets may be lethargic and have diarrhea or bloody diarrhea, fever and vomiting. Infected but otherwise healthy pets can be carriers and infect other animals or humans. If your pet has consumed the recalled product and has these symptoms, please contact your veterinarian. Sir, would you like to meet a Bichon??? NATIONAL DOG DAY IS TODAY!!!!!! Yes-- ANOTHER Dog food RECALL again! And he does not know it! what are girls made of? And you think I am difficult????? 2 wonderful, easy safe treats for 4 leggeds!!! who put dinner in charge??? Momma... are you shopping yet?? ?